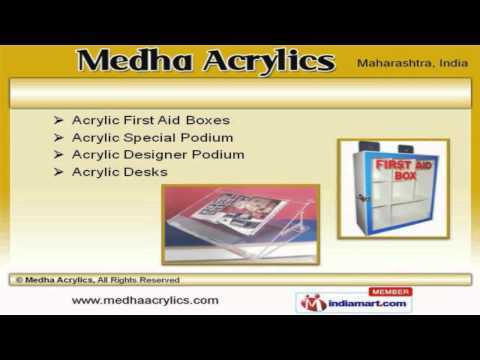 Welcome to Medha Acrylics, Manufacturer and Trader of Acrylics Plastic Products. The company was established in 2009 at Pune. We serve to Institutions, Malls, Shops and other areas. Unsurpassable quality standards, High operational efficiency and Cutting edge technology are some of the key factors behind our success. We offer a wide variety of Modern Acrylic Furniture, Acrylic Showcases and Cabinets. We are engaged in offering supreme quality Acrylic Handicraft Lamps, Name Plates and Rotational Displays. Acrylic Brochure Holders, Corporate Gifts and Chart Holder are in huge demand across the global markets. Acrylic First Aid Boxes, Special Podium and Desks are some of our best selling products. We also provide Acrylic Key chains, Acrylic Paper Holders and Weights that are a class apart. Our organization is highly involved in providing an impeccable range of Acrylic Mobile Holders, Pen Stands and Hot Products.